The events that took place in East Jerusalem during recent weeks have re-exposed the complex and explosive reality of relations between Jews and Arabs in the city and the tension between East and West Jerusalem. Against this background, let us look at the data relating to Palestinian residents in Jerusalem and the current situation in East Jerusalem. According to data of the Central Bureau of Statistics, as of late 2012 the Palestinian population of Jerusalem numbered 300,200 residents, constituting 37% of the total population of Jerusalem (815,300). The relative size of this population group in the city increased from 26% in 1967, 28% in 1980, and 32% in 2000. The population comprises a vast Muslim majority (96%) and Christian minority (about 4%). East Jerusalem – that is the territory added to the city after June 1967 – has 297,900 Palestinian residents, who constitute 99% of the total Palestinian population of the city as a whole and 60% of the residents of East Jerusalem. 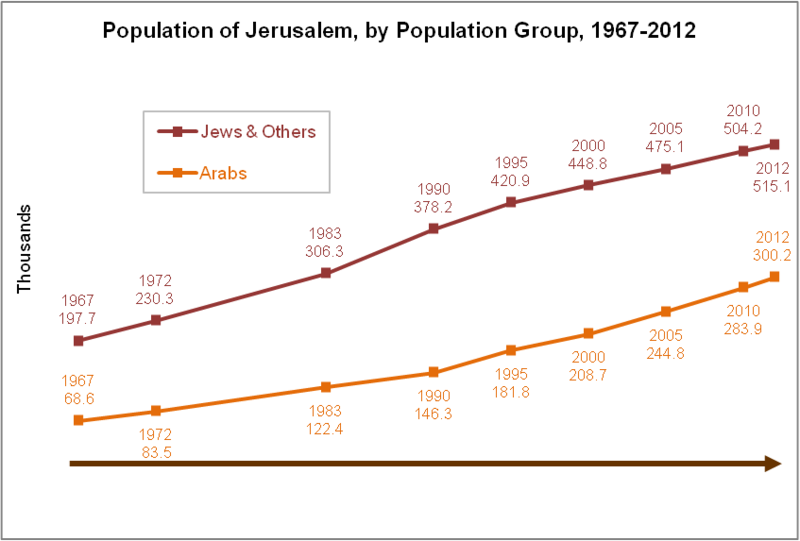 In addition, East Jerusalem has 199,650 Jewish residents, constituting 40% of its population. The largest Arab neighborhoods in East Jerusalem are Beit Hanina (34,800 residents), the Muslim Quarter (29,100 residents), Ras al-Amud (24,100), A-Tur (23,600), Shu‘afat (22,800), Jabal Mukaber (21,900), and Silwan (19,100). Palestinian residents of East Jerusalem have the legal status of residents of Israel, which includes rights to social security and national health insurance as well as freedom of movement throughout Israel. Yet they are not citizens and therefore have no right to participate in elections to the Knesset or to receive an Israeli passport. They do, however, have an affiliation with the Palestinian Authority: they have the right participate in elections to the Palestinian parliament, and their schools use the Palestinian educational curriculum. The Palestinian population of Jerusalem is characterized by a young age structure, with a median age of 20.2 (compared with 25.9 among Jews in the city). The total fertility rate among Palestinian women is 3.6 children. In recent years this rate has been declining, having stood at 4.1 in 2006. Interestingly, the total fertility rate among Jewish women in Jerusalem is higher (4.3), as a result of the high overall fertility rate among ultra-orthodox women. The poverty rates within the Palestinian population of Jerusalem are very high: 77% of families are below the poverty line, compared with 21% of Jewish families in the city. The rate of participation in the workforce among the Palestinians of Jerusalem stands at 67% for men and 14% for women (compared with 52% and 59% among Jews, respectively). The main economic sectors in which Palestinians are employed are wholesale and retail trade and repairs (21%), construction (13%), accommodation and food services (11%), and education (11%). The Jerusalem Institute for Policy Research (formerly the Jerusalem Institute for Israel Studies) is the leading institute in Israel for the study of Jerusalem’s complex reality and unique social fabric. Established in 1978, the Institute focuses on the unique challenges facing Jerusalem in our time and provides extensive, in-depth knowledge for policy makers, academia, and the general public. The work of the Institute spans all aspects of the city: physical and urban planning, social and demographic issues, economic and environmental challenges, and questions arising from the geo-political status of Jerusalem. Its many years of multi-disciplinary work have afforded the Institute a unique perspective that allowed it to expand its research and address complex challenges confronting Israeli society in a comprehensive manner. These challenges include urban, social, and strategic issues; environmental and sustainability challenges; and innovation and financing.